A little while ago my beautiful neighbours gave me a bunch of lemons picked fresh off their tree. While pondering what I could do with these little beauties, I found a scrummy recipe for Lemon Chicken which uses 'preserved lemons', which was thoughtfully proceeded by a recipe for preserved lemons! Perfect! 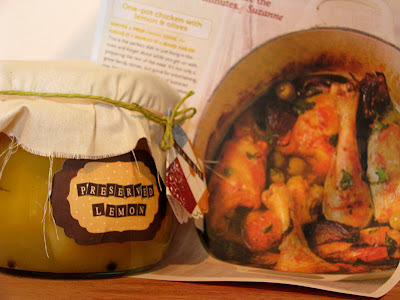 I ended up making 2 jars of the lemons, with the intention of giving one back to them to put in their cupboard. Well, today (6 weeks later! ), I finally managed to do up some little tags, and a label using the gorgeous Labels 4 spellbinder that Karen graciously lent me for a 'little while'. Thanks sweetie! I will return them soon. I took them over this afternoon with the recipe that I'd found in the magazine, and they loved the little package that I'd made. That made me smile! :) I'm so thankful for all the friends we've made since moving here. Our lives wouldn't be the same without them as a part of it! Its nice how a surplus of homegrown can create a snese of community and create bonds between people isn't it. : ) So was it a good recipe Leah? You label is very sweet. What a great idea Sis, and I first thought when i saw the label, that you had managed to find a label 4.Bizzy Becs sells them BTW.Saw them in there the other day when I was showing Mum the site. Yum, that looks so gorgeous!! Thanks for sharing the links with me, mwah!